This smooth and creamy tahini fudge is a wonderful low carb, healthy treat. It’s so good to enjoy a decadent dessert that’s actually good for you! 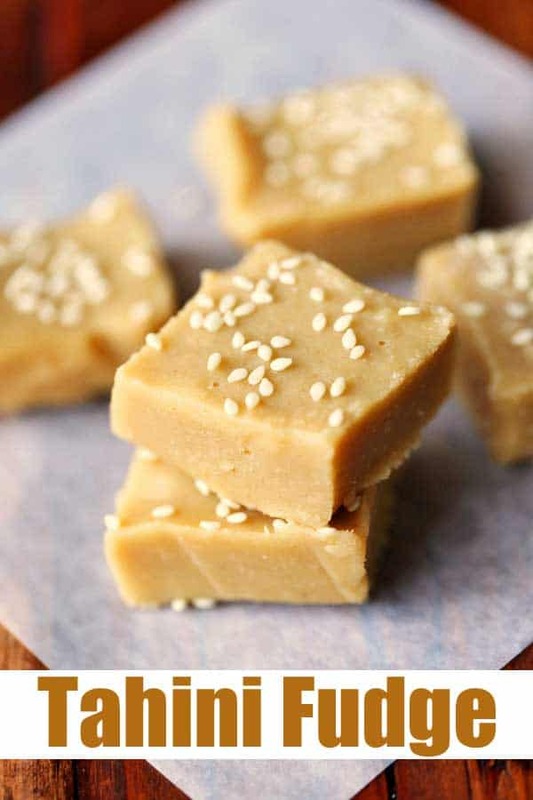 Does this tahini fudge taste like halva? Since this tahini fudge contains no sugar and is sweetened with just a few drops of stevia, it does not have the texture of halvah. It is naturally soft and needs to be kept in the freezer. But it is wonderful – a rich, creamy, decadent dessert that you can feel good about eating. I believe it is. Sesame is a good source of antioxidants. Recent research indicates that for most healthy people, butter is pretty much harmless. And stevia is probably harmless as well. 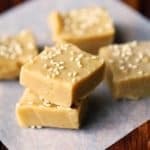 How to serve tahini fudge? Take a square out of the freezer just a couple of minutes before you want to enjoy it, and allow it to soften a bit before you savor it. Sometimes I place a square of tahini fudge on a square of Lindt 90% chocolate and enjoy them together. It’s a wonderful combination! How long can you store homemade tahini fudge? Since you should keep it in the freezer, you can store it for a long period of time – about three months. After you cut it into squares, place the squares in a freezer bags or in an airtight container, and store in your freezer. If you’re looking for savory recipes that use sesame butter, try this wonderful tahini sauce recipe. And another really good fudge recipe is this recipe for peanut butter fudge. 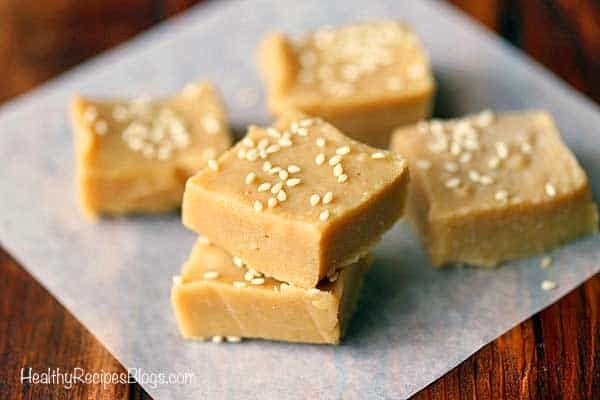 This smooth and creamy tahini fudge is a wonderful low carb, healthy treat. It's so good to enjoy a decadent dessert that's actually good for you! In a medium saucepan over low heat, add the tahini, butter, vanilla and stevia. Mix with a rubber spatula until smooth. Remove from heat and mix in the coconut flour. Pour the mixture onto a glass square 8-inch pan. Cover and place in the freezer until set, about 2 hours. Cut into 25 squares and serve. Keep leftovers in the freezer.